When one thinks of Japanese Restaurants one would normally think of Kuala Lumpur or maybe...Sri Hartamas even? Lately another township has emerged as the Japanese capital of Malaysia. Yes my friends, welcome to ma crib SUBANG JAYA y'all!!! Of the dozens of Jap restaurants around town, Kinpachi is certainly one of the oldest if not the oldest place here. Me and my family are frequent customers of Kinpachi and the quality of food has been the same since years ago. I love the location of kinpachi as well, easy to find parking compared to other places and enjoys a little bit of secrecy being tucked away in the quiet little corner of ss17. Green Teas here are free, and you will be greeted with a complimentary appetizer which are different everyday. Today, its fish fillets ala chinese style. Yummy. I ordered their yakitori first. chicken balls, tomatoes wrapped with bacon & pork belly. Aromatic. Fresh. Tender. Superb. I ordered their signature bento set, the kinpachi bento which comes with sashimi, tempura prawns, japanese mashed potatoes, tofu, fried pork, eggs and ketchup spaghetti. Of course with rice, miso soup, japanese pickles, salad and mixed fruits. The sashimi was superbly fresh, normally with salmon, tuna & butter fish. pork was moist and perfectly fried, and the best? their mashed potatoes which was smooth like butter with traces of egg white making this one of the best mashed potatoes around. A definite must try. My dinner partner ordered the sashimi bento set, with fresh sashimi and tempura prawns and veg. equally fantastic as well. The meal was completed with the presence of, of course, alcohol. Cold sake and Kirin beer were the norm, with some snacks as well. This time we choose the shishamo. If you are a sake lover, you wouldn't wanna leave this place. With over 20 different kinds of imported sake, even I couldn't try everything here. Shishamo was fantastic. Perfectly grilled to perfection and filled with maximum amount of roe. Simply wonderful. The bill for this scrumptious meal came only around RM130...pretty cheap if you considered the amount and quality of food, plus alcohol involved. Heres a map and details of the place for you readers. 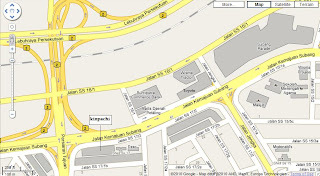 Kinpachi is located near the ss17 Shell Station, just opposite the new Toyota showroon. You should be able to see a Kia showroom at the G floor. so who is the dinner mate?